Microsoft has finally pulled the trigger and announced availability of its Surface Windows 8 Pro, the big brother to the previously released Surface RT tablet. Beginning February 9, Microsoft will sell the Pro (starting at $899) in its retail outposts, online at MicrosoftStore.com, and via third-party retailers like Staples and Best Buy in the U.S.
Judging by reader comments here and elsewhere, there seems to be a little confusion regarding what this device is supposed to be, particularly when you look at the price point. It's much more expensive than a Galaxy Tab or iPad, but on the lower end for a decent laptop. The closest comparison might be to an ultrabook, against which the cost seems comparable. But price is only part of the story. The Surface Pro, more so than the RT model, is a category-defying entry. 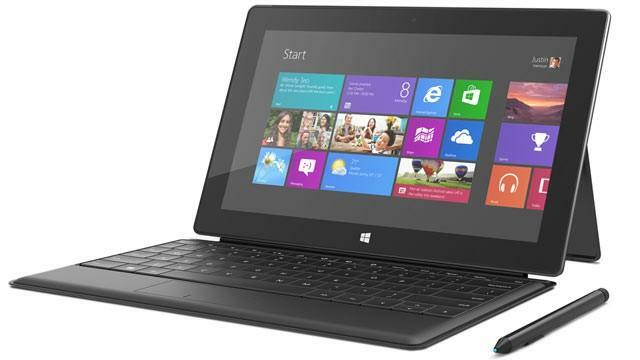 It has all the capacitive touch goodness of a tablet, but with specs worthy of an ultrabook or laptop. Tablets are known for their ARM processors, but this puppy has an Intel Core i5, as well as up to 128GB of solid state storage. (The alternative is 64GB.) On the software side, you're looking at a full-fledged, desktop-worthy Windows Pro with legacy application support, not the stripped-down Windows 8 operating system apparent in the Surface RT — which, notably, had underwhelming sales. So the Surface Pro is like a mash-up of sorts that falls somewhere between a tablet and an ultrabook. As such, it may have a tough time making its case to consumers and defining (or proving) itself. What Microsoft does have is a long history as the dominant player in desktop OSes, and it hopes to parlay that into success for its next-generation operating system and device. But first, it needs to clarify itself to the general public. That's no easy task, and indeed, the company seems to know it too. Microsoft put together its version of an elevator pitch that attempts to explain itself to the masses. A dark titanium-colored device that physically looks a lot like the Surface RT, but is just a little fatter (at 14mm) and slightly heavier (at 2 lbs.). The Pro offers an Intel Core i5 processor, 10.6-inch display (1920×1080 full HD resolution), and front and rear 720p HD cameras. A capacitive Surface Pen (featuring Palm Block) in the box, but no attachable keyboards. The pressure-sensitive Touch version costs $120, and the Type keyboard (with actual keys) sells for $130. The keyboards are compatible with both versions of the Surface. A tough call regarding storage. The 64GB version is cheaper, but would really only work if the Pro is an adjunct device. As a main terminal, however, that is a microscopic amount of storage, and even that roomier 128GB model could be too restricting for power users. Unfortunately, those are the only two options. What's your take on the Pro? Can it appeal to the masses? And are you planning on picking this up, waiting for the next iteration or bypassing it altogether? Let us know in the comments. For more about the Surface Pro, click here to check out TechnoBuffalo's coverage.